Going cordless frees the humble DIY-er from awkward wires and dangerous trip hazards but battery-powered rivals typically can't cope with the power put out by their plug-in brethren. Also, despite huge advances in battery technology, the cordless drills of this world will soon find their power source drained if drilling through particularly stubborn substances or ridding the extra large bathrooms of tiles. If the job is heavy duty, it will typically require a drill that can be plugged into a constant and reliable source of electricity that comes from a standard 240V home power outlet. It's a bit of a mouthful but the new DeWalt D25033K-LX SDS+ Hammer Drill is tough as old boots, can drill into concrete and masonry from 4-22mm in diameter and weighs less than 3kg. It's also not terribly pricey. The DeWalt range is designed with professionals in mind, and can be used and abused every day of the week, should you be that obsessed with home improvement. With three distinct drilling modes, this chunky hammer drill from professional-grade tool vendor DeWalt has the muscle to tackle even the toughest of home projects. A Rotation Stop mode sees it miraculously transform into a powerful chiselling tool, Impact Stop Mode is superb for rotary only drilling of wood and metal, while a final full hammer mode is powerful enough to punch holes into concrete and masonry up to 22mm in diameter. There are a number of additional touches that justify the lofty price tag, including the inclusion of a mechanical clutch that helps prevent any awkward jolting if the bit should snag. Air slots keep dust away your eyes, although if you're going this rowdy on a wall, you really should be wearing safety specs as well. It's not a household name – except in my household – but Ozito turns out solid power tools that are surprisingly robust given their 'entry-level' price tag. This industry standard, SDS+ chuck compatible rotary hammer drill can hammer, drill and chisel like its more expensive rivals and can make 40mm diameter holes in timber, 28mm in masonry and 13mm through steel. The only downside is that this drill will require lubrication to ensure its longevity and as such, even comes with a little pot of grease. This feels slightly disturbing in the 21st Century. For them, Bosch has created this extremely approachable Easyimpact compact drill. It's lightweight, easy to handle and comes kitted out with a handy assistant that sets the exact drilling depth and helps collect excess dust and debris in a small container. This is really designed with the less macho DIY-er in mind, so can only poke a 10mm diameter hole in concrete. 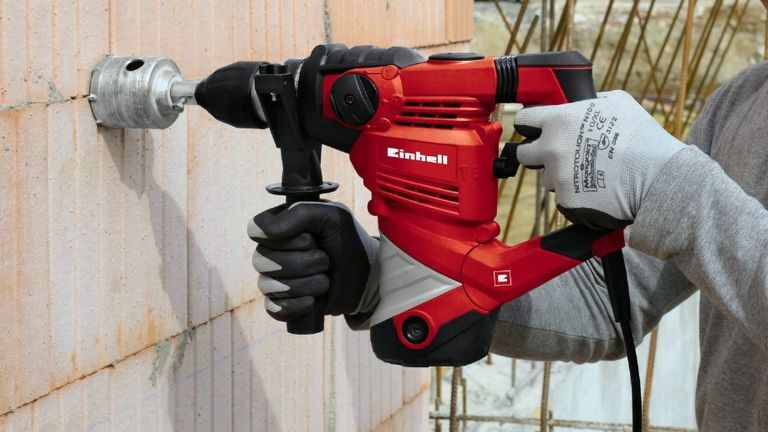 With a masonry-drilling diameter of 26mm, this absolute monster from Einhell is the chap you call upon when anchoring into concrete, creating massive holes in solid walls or chiselling away major renovation projects. It's big, it's heavy and it's very noisy but it costs less than £100 and comes complete with a two-year manufacturer warranty. It's a tough cookie. For those wanting serious longevity and a professional finish to the job, it's difficult to ignore Makita and its line of high-performance power tools. While this unit might look like the competition at first glance, it's actually compatible with some serious drill bits, such as a diamond core offering that means it can punch enormous 80mm holes in concrete. Of course, it's also more than happy to drill, drive and chisel, thanks to its numerous different modes, while an advanced torque limiter protects the engine and the user in case of locking and snagging. It's also extremely lightweight for such a powerful unit, and while the price is a bit higher than the others here, you do get what you pay for.